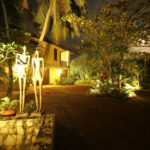 For a description of our rooms please see our ‘ROOMS AND RATES’ section. 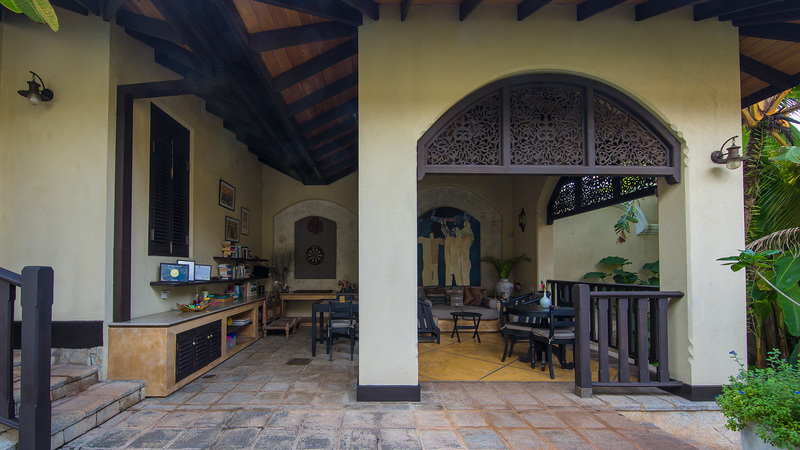 A key feature of Sergeant House is its large open sided ‘ambalama’ (rest pavilion) which is a perfect place for relaxing, dining, reading, enjoying a cool drink or pot of tea. 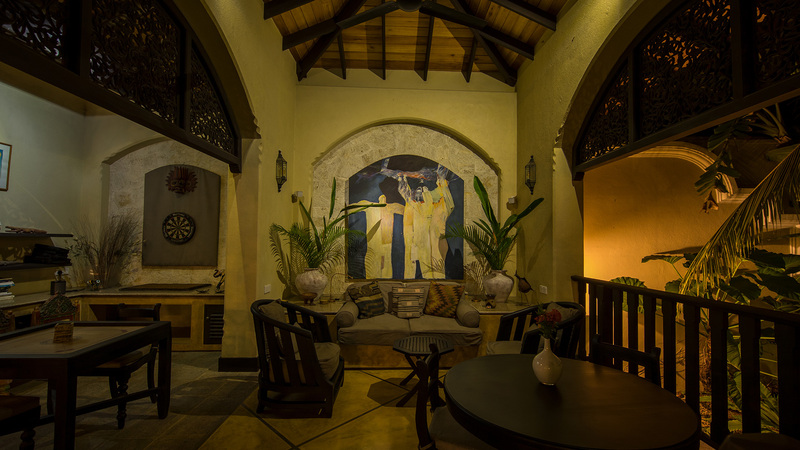 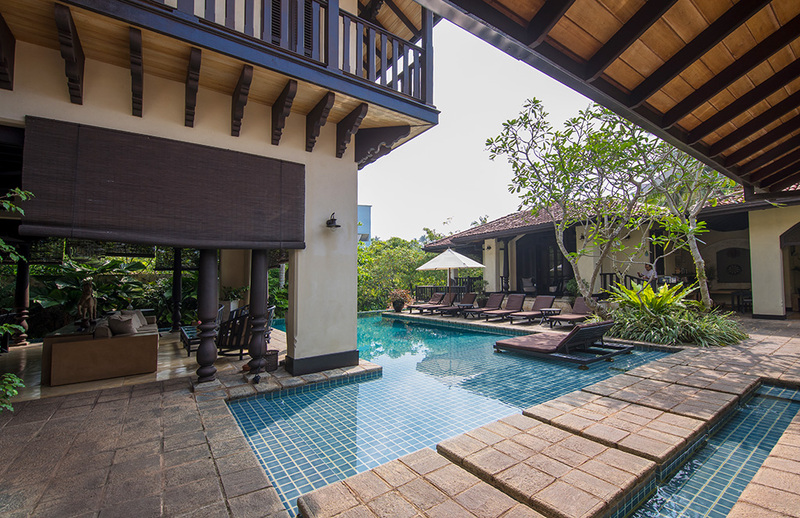 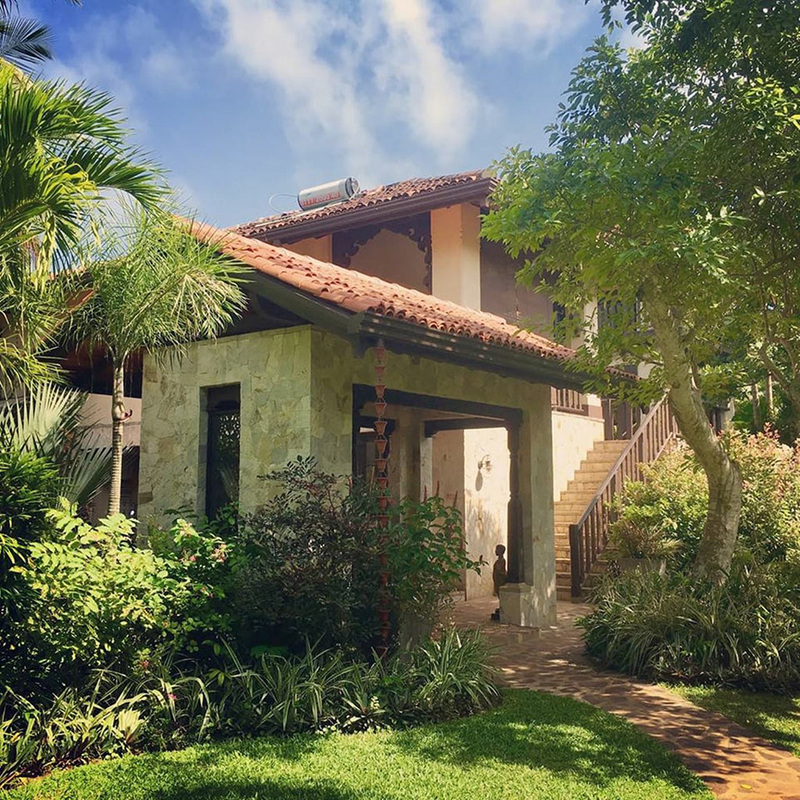 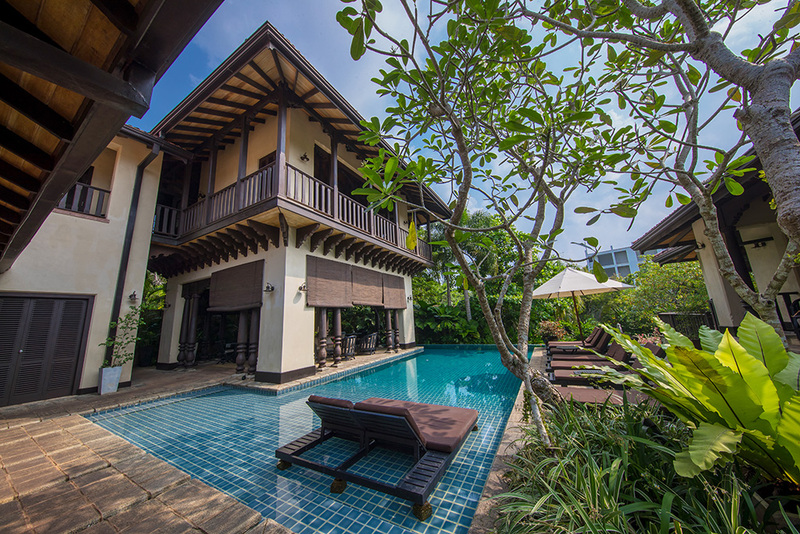 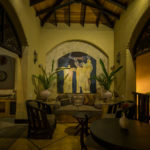 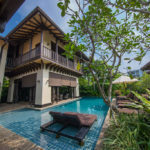 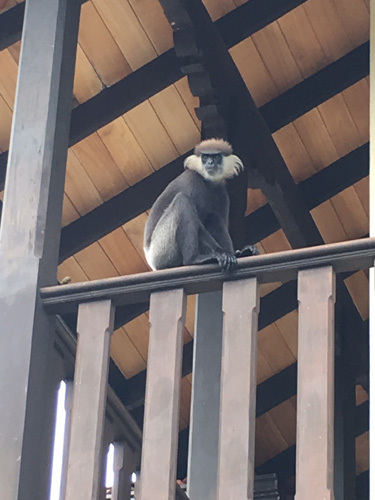 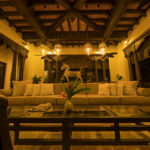 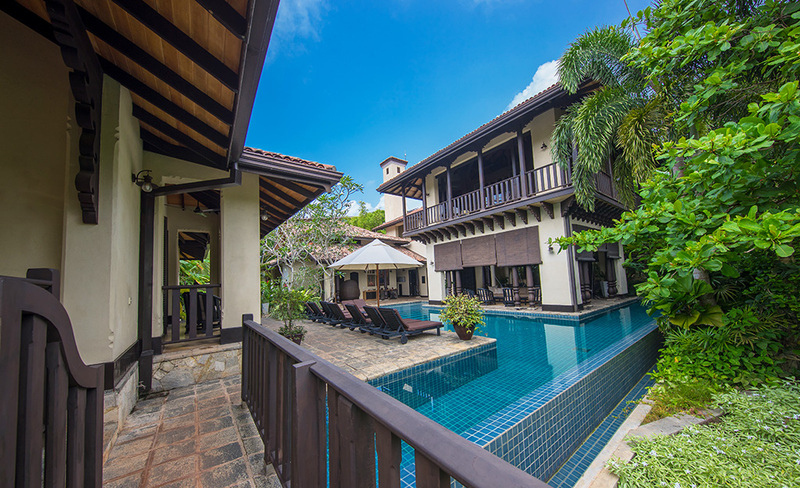 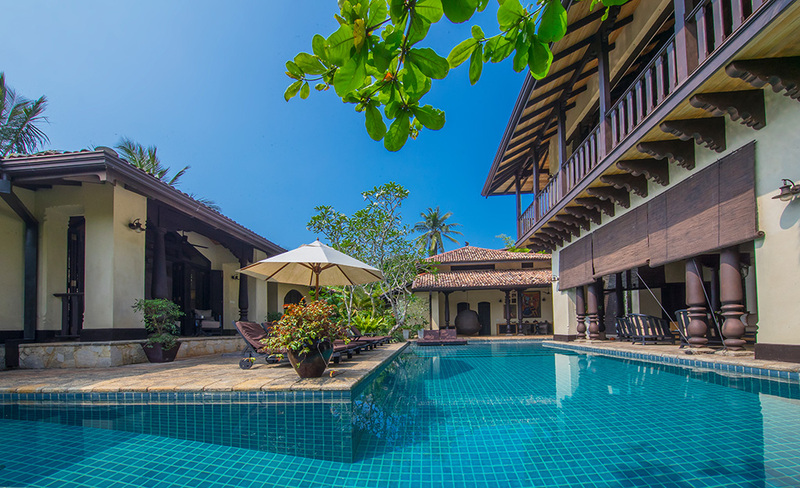 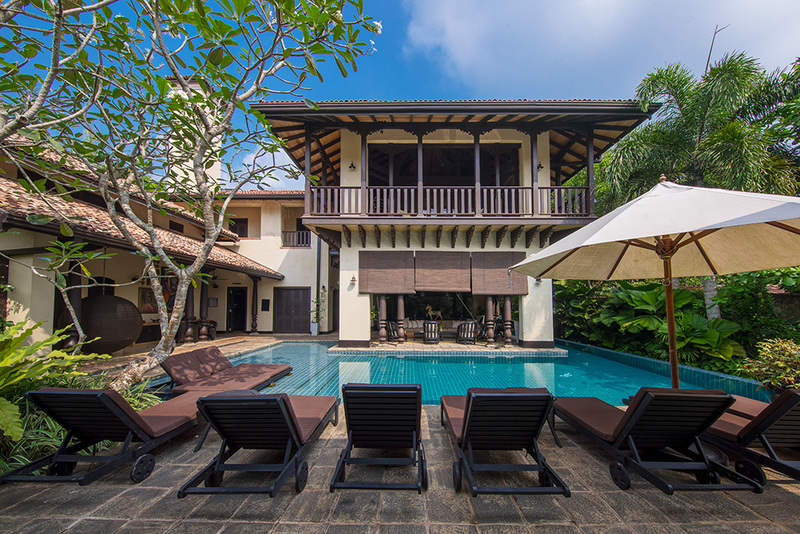 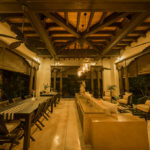 The ambalama has impressive deeply carved timber beams and columns, a high ceiling and is ringed on three sides by the swimming pool and tropical gardens. 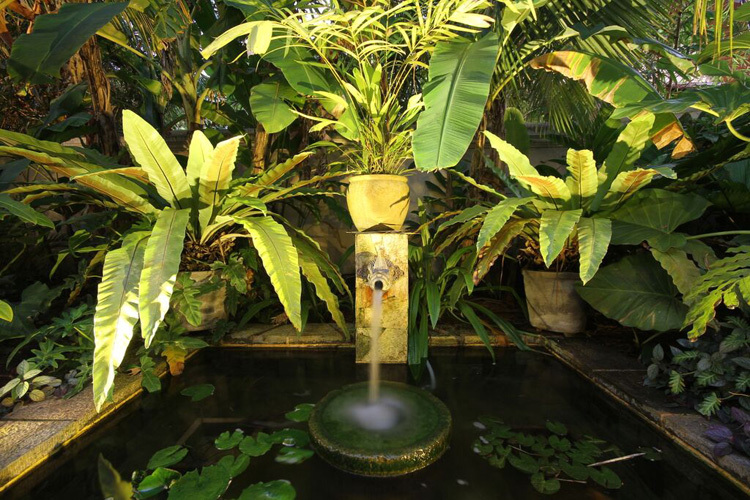 This ensures a cooling effect as air passes over the surrounding water and across the pavilion. 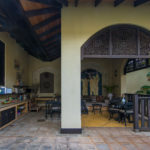 It is furnished with fresh flowers, overhead fans, glass bell chandeliers, deeply cushioned lounges and chairs and a long banquet table that can be divided into smaller arrangements if preferred. 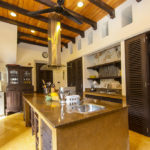 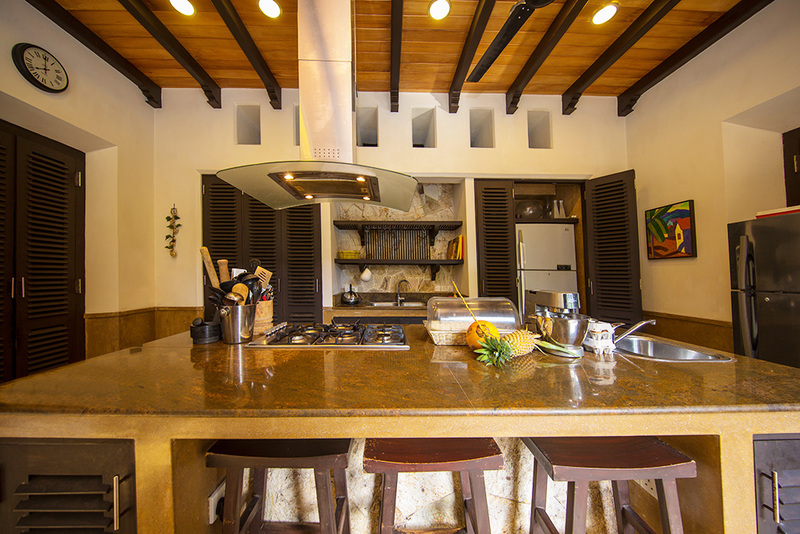 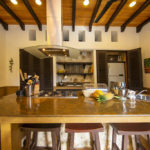 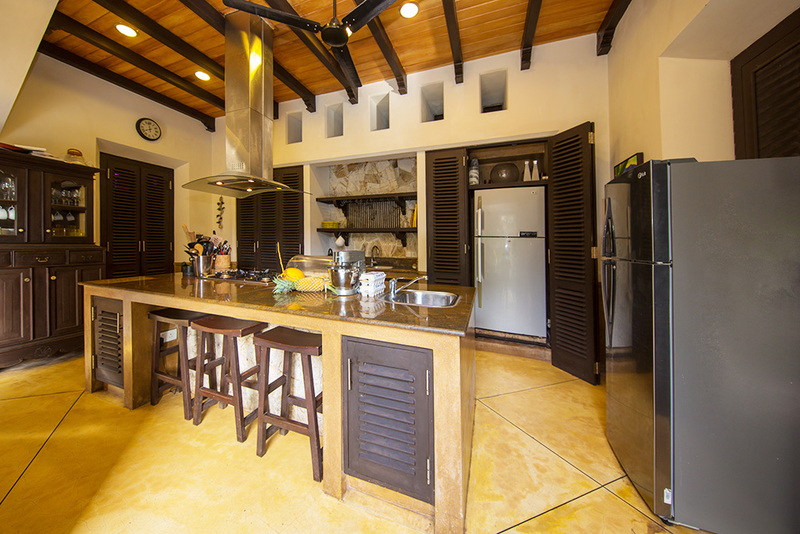 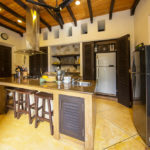 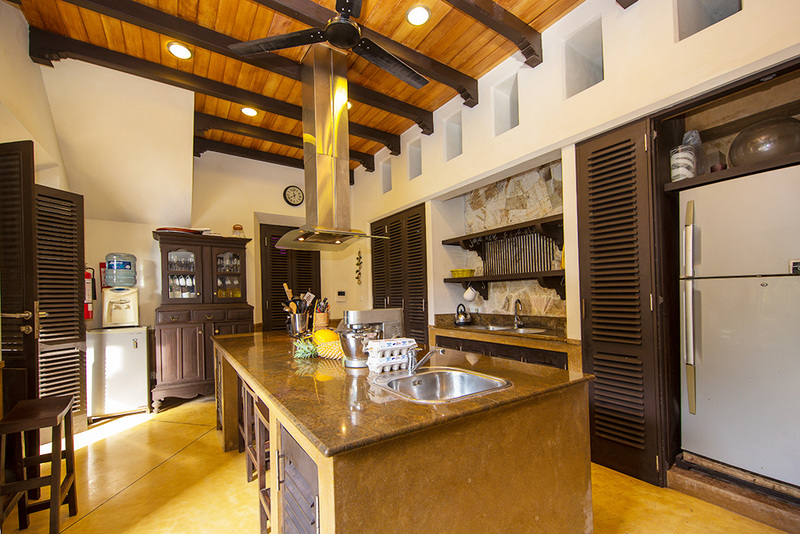 Our kitchen has been designed to allow us to conduct cooking classes in Sri Lankan cuisine. 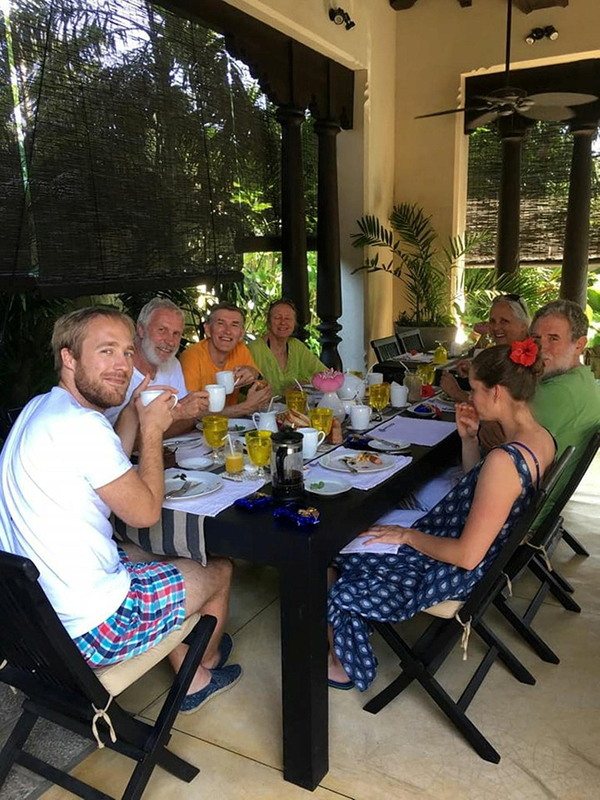 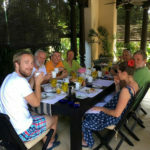 If you fancy learning how the delicious curries and other Sri Lankan dishes you have sampled are created, we can arrange for our experienced chef to pass on his valuable insights. 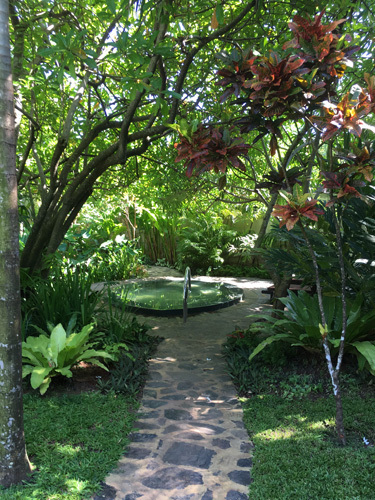 A massage room has been built in the gardens to allow our guests to enjoy a relaxing spa experience, soothing their aches and tensions away. 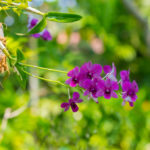 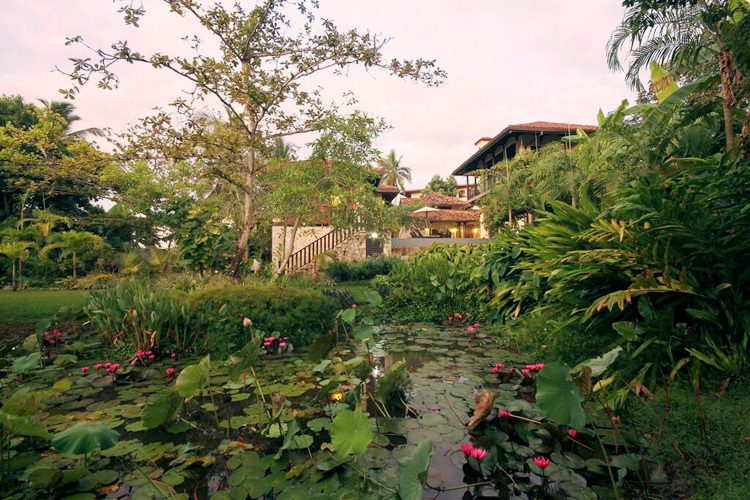 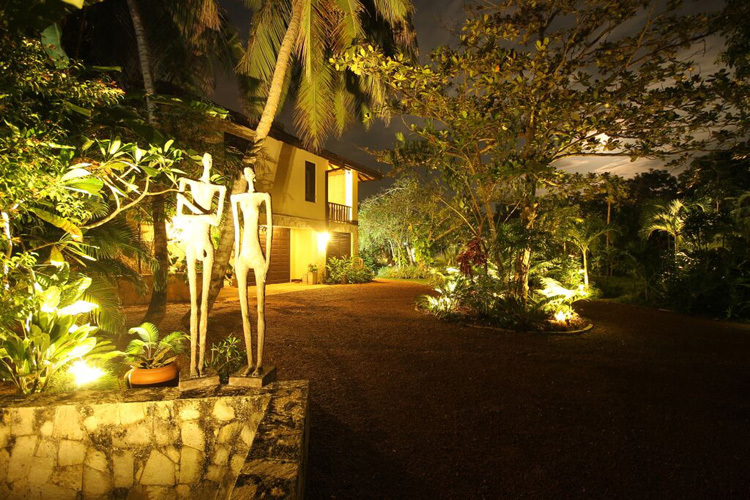 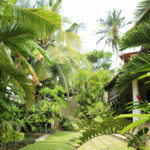 Sri Lanka is renowned for its Ayurvedic approach to health and well being. 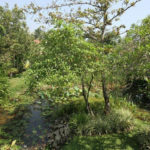 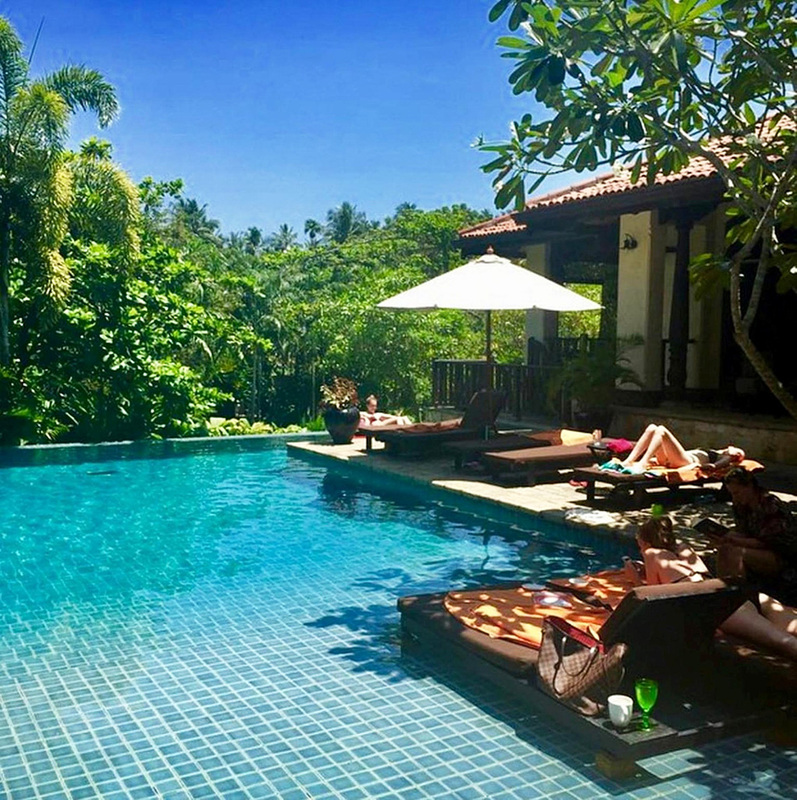 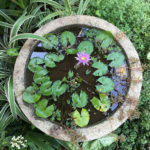 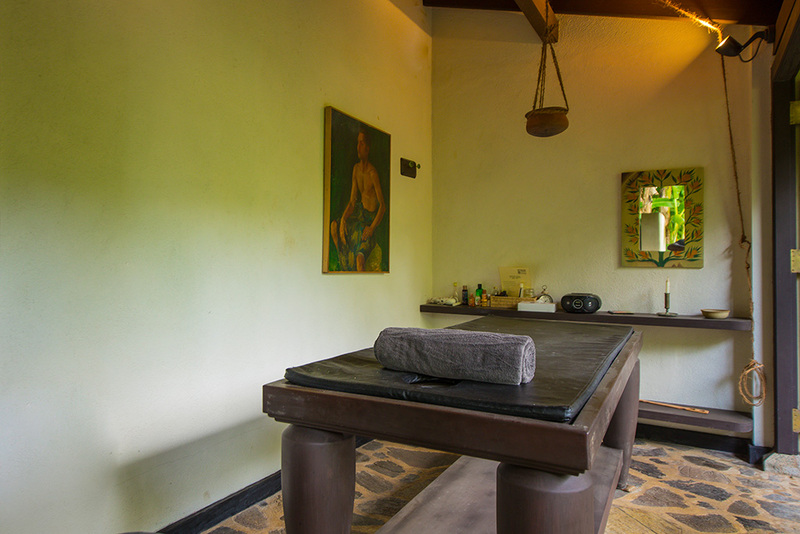 Book a therapist and experience an Ayurvedic massage using oils infused from the bouquet of plants that made Sri Lanka renown since the 16th century; or try a more specific massage, tailored to suit your particular needs. 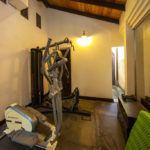 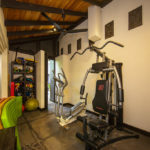 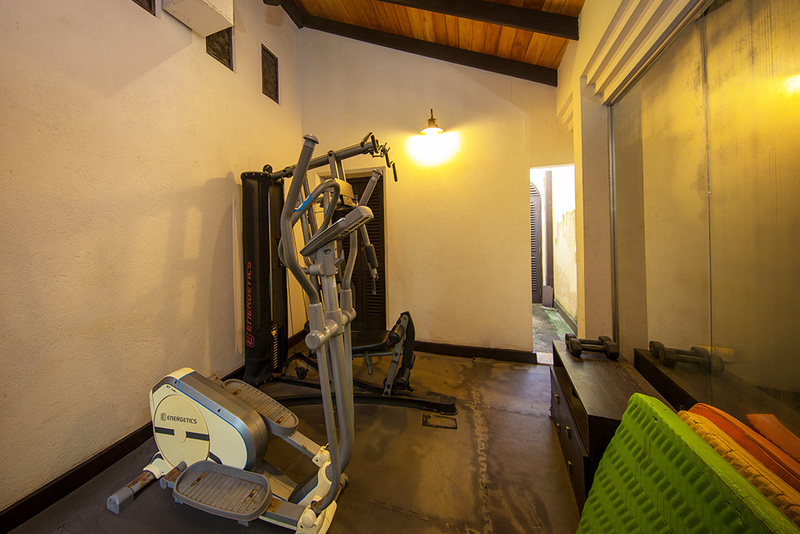 Although compact, our gym contains a cross trainer, abs exerciser, multi-gym machine, yoga mats, etc. 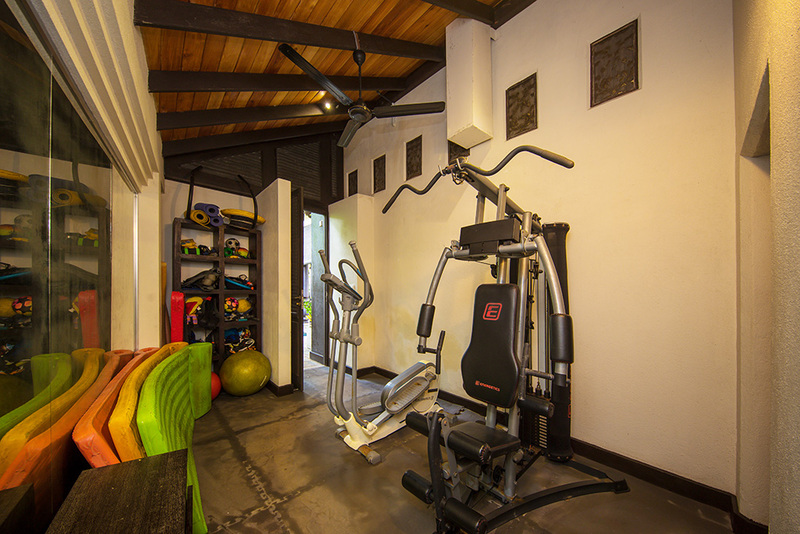 Combine this with our 20m lap pool and our guest have everything they need to maintain their highest fitness levels. 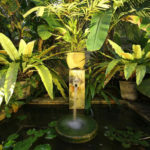 Wrapping artfully around 3 sides of the ambalama. 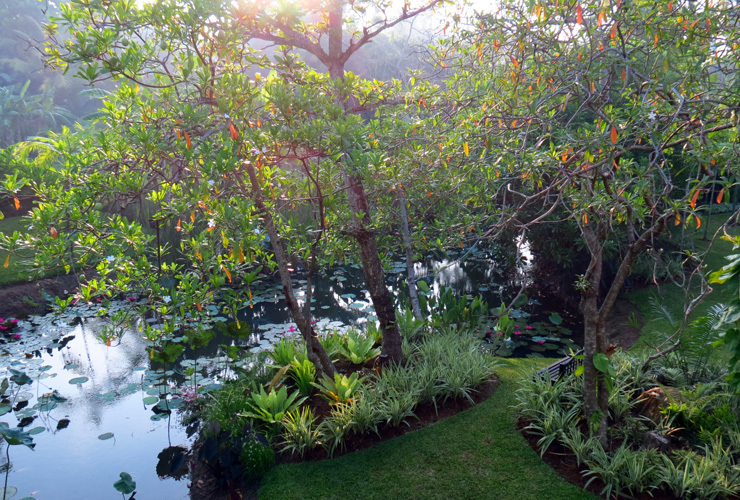 It has a long infinity edge ‘spilling’ onto our lower terrace waterlily pond and out into the rural landscape. 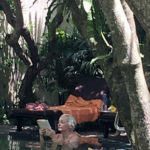 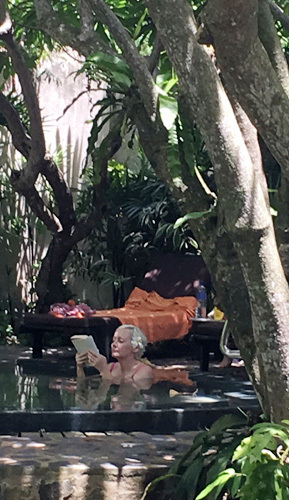 A double sun lounge appears to float in the shallow section of the pool, under the shade of a frangipani tree. 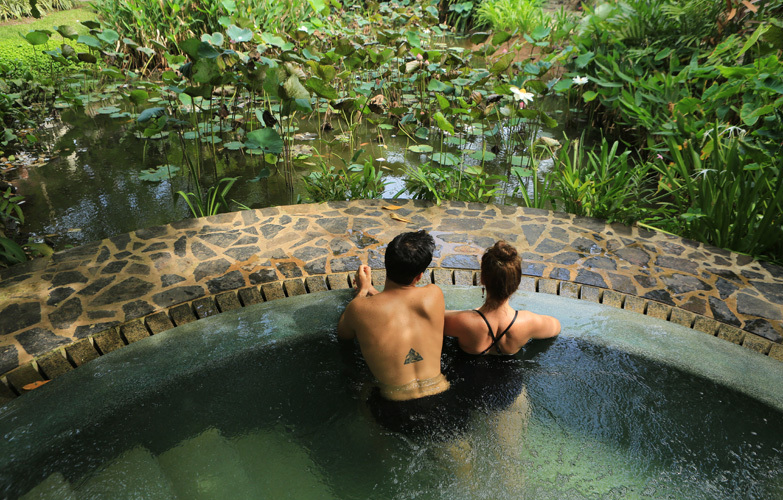 An integrated lap pool, measuring 20 metres in length, allows those more energetic guests to sustain their fitness level. 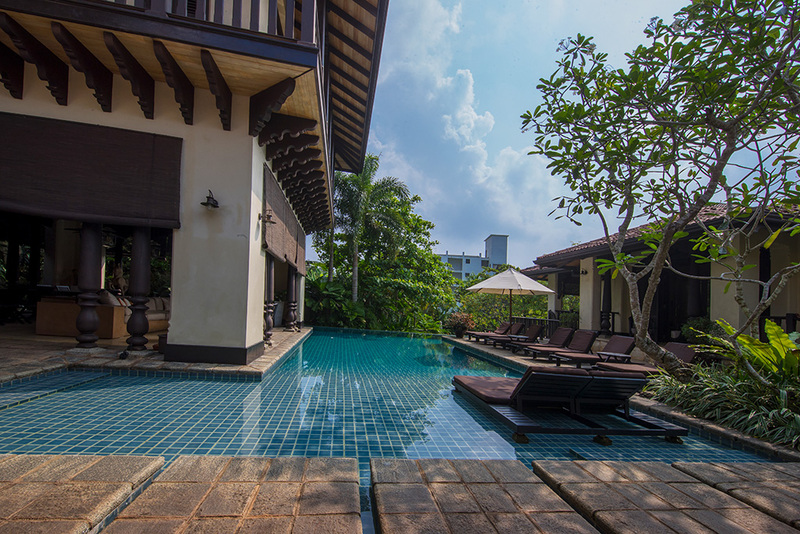 We can further enhance the enjoyment of your swim with a cool poolside drink as you relax and soak up the ambience of Sergeant House. 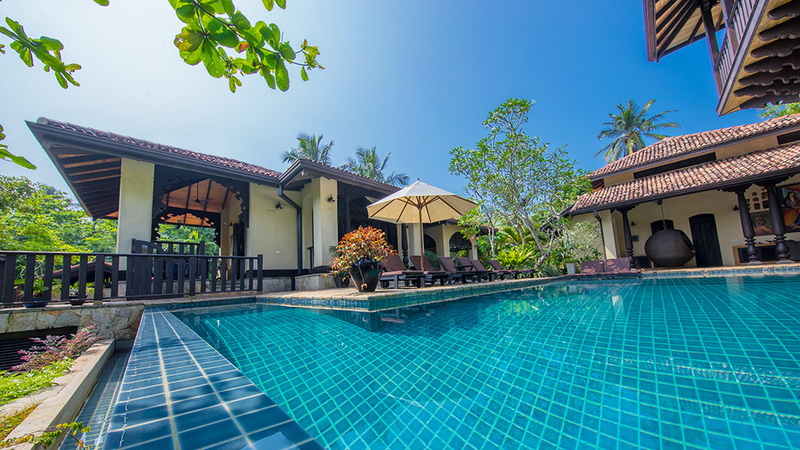 Pool floats are available upon request. 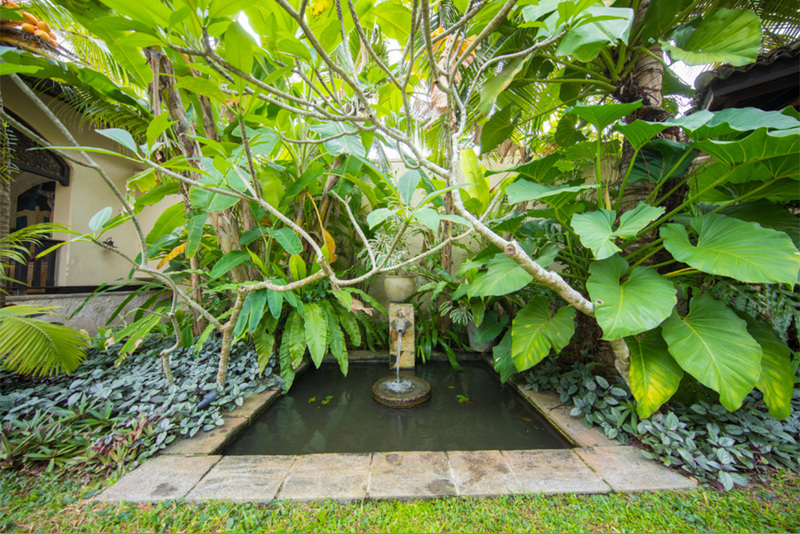 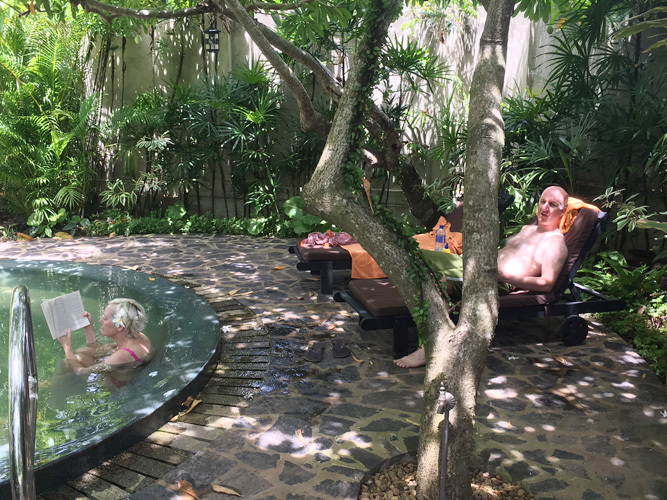 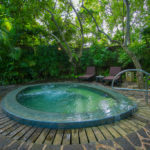 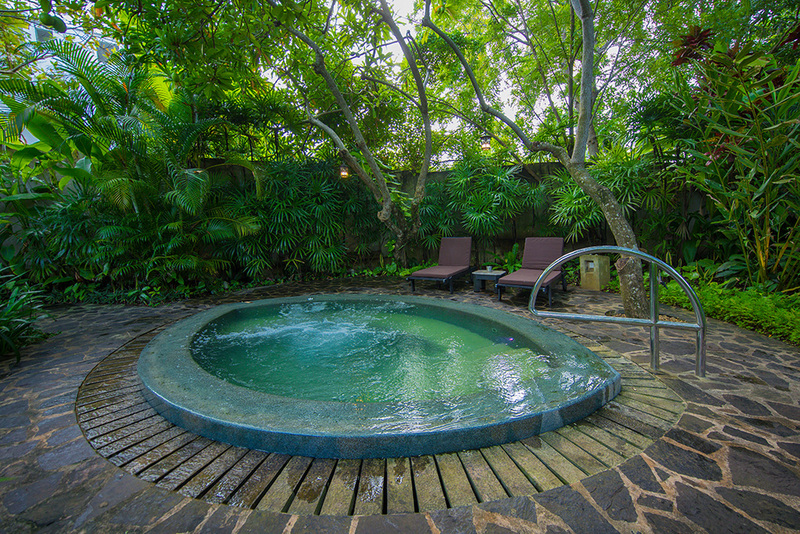 In a secluded corner of the garden, next to the lily pond and in the shade of a cluster of wild trees, is our cool-water spa pool. 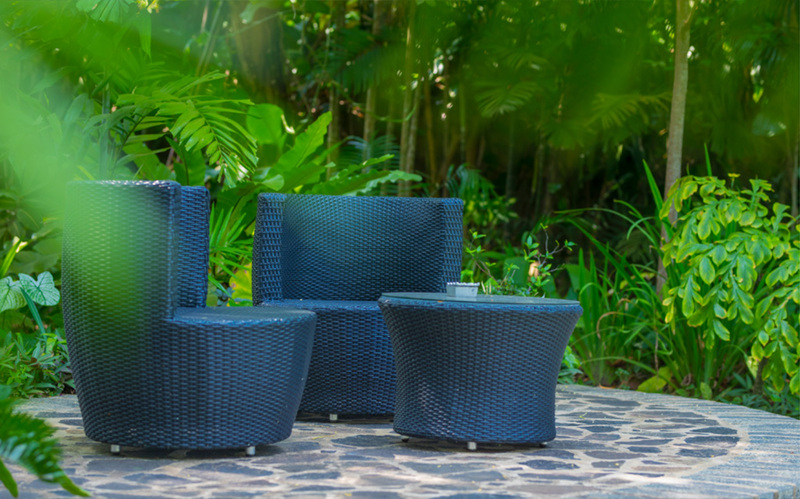 Use the invigorating massage jets or just reelax in the lovely garden setting. 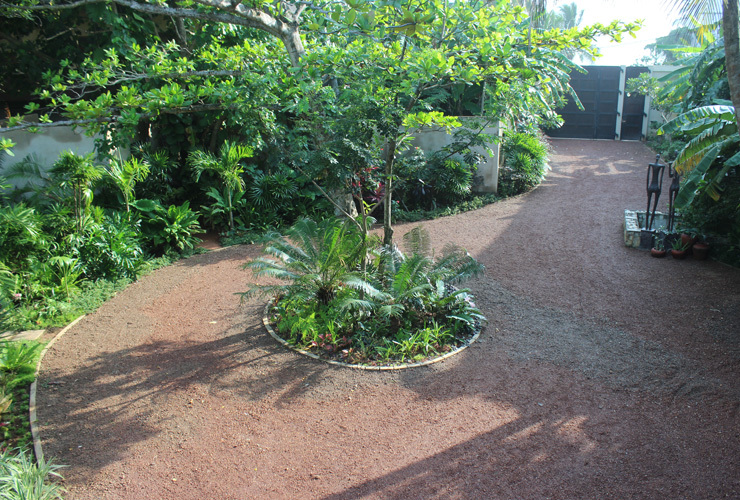 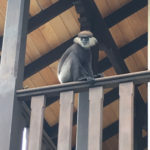 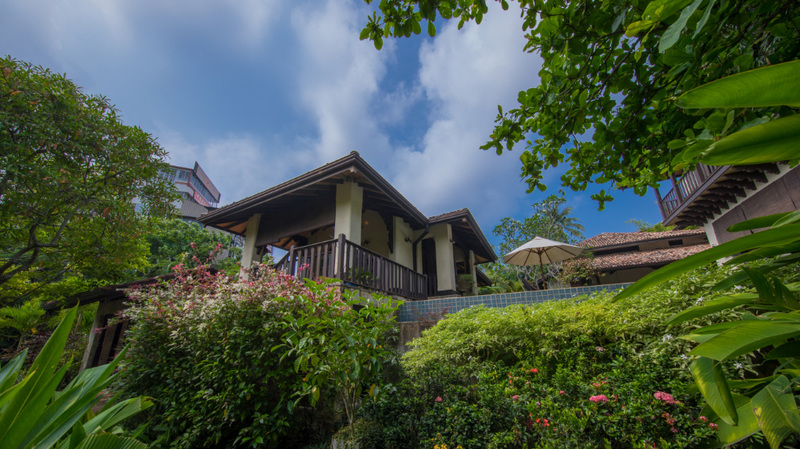 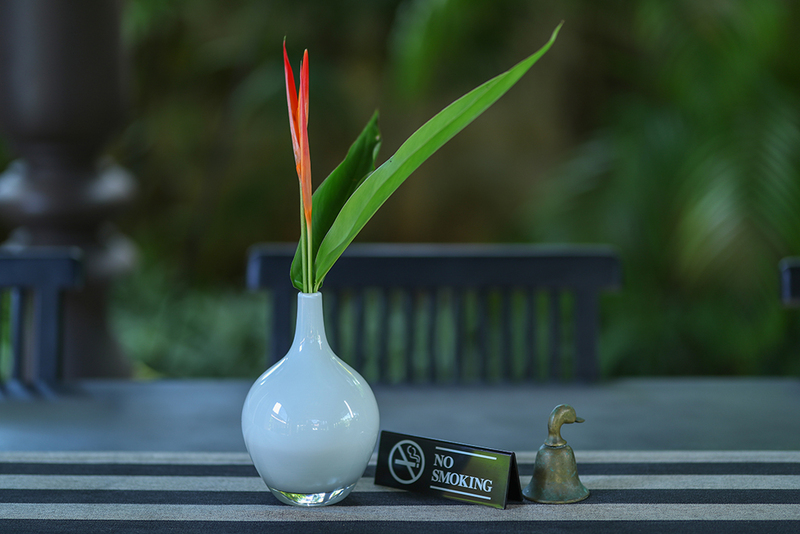 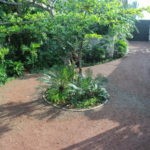 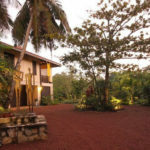 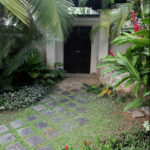 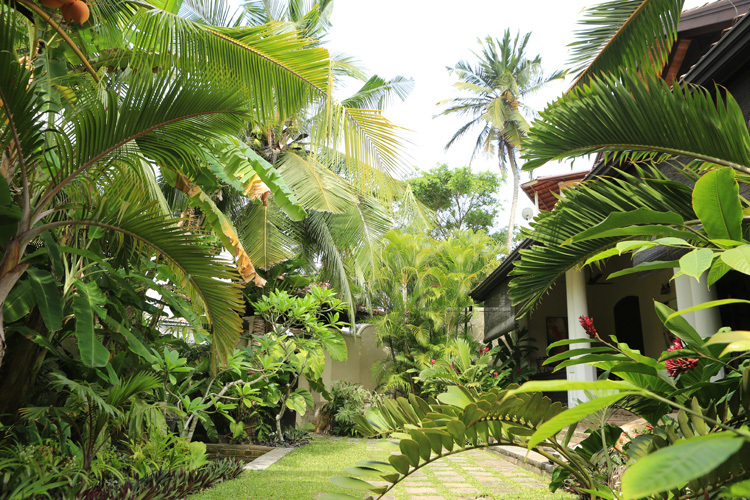 Our bungalow and suites all have wide verandahs designed for both shade and privacy. 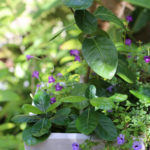 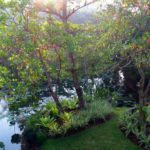 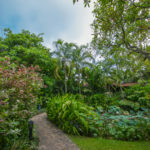 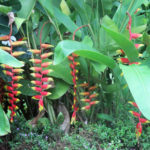 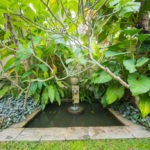 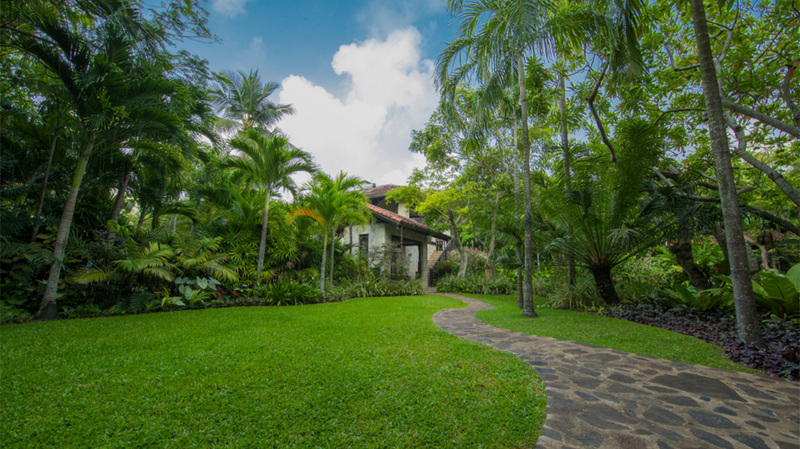 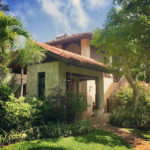 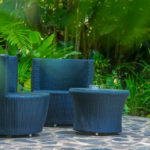 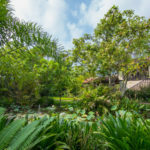 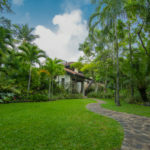 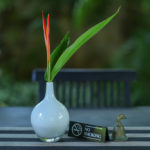 They offer good glimpses into gardens and capture the gentle tropical breezes, allowing guests to escape the occasional rain or heat of the day. 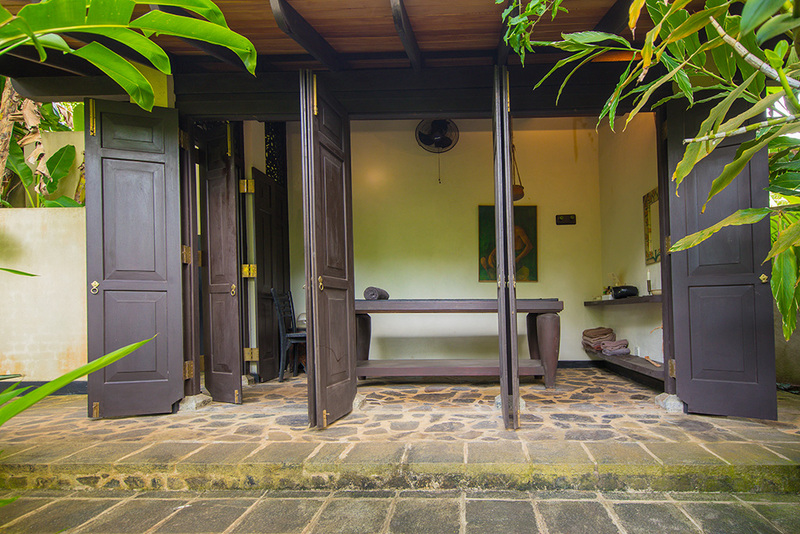 Each verandah has fans, comfortable chairs and coffee tables. 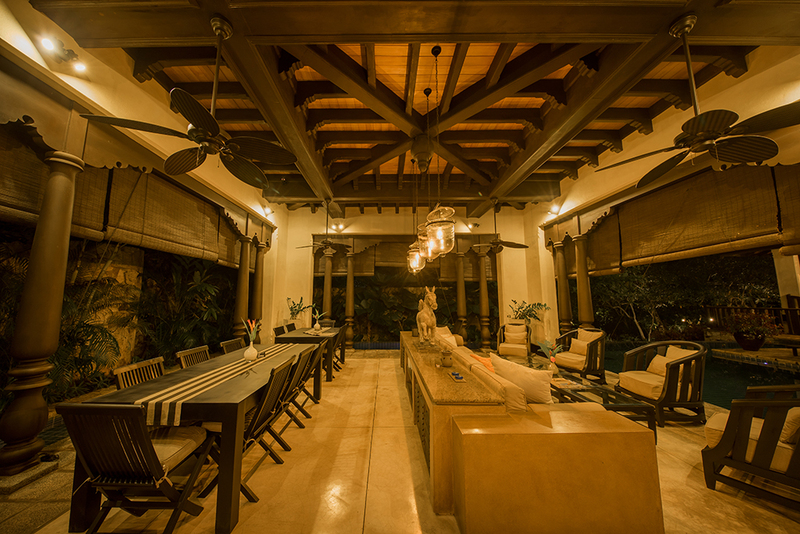 Just completed in 2016, this indoor/outdoor room is next to the pool and provided a relaxing area to chat and play board games, darts or Karam. 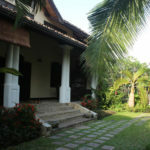 A large selection of books and children’s toys are also available. 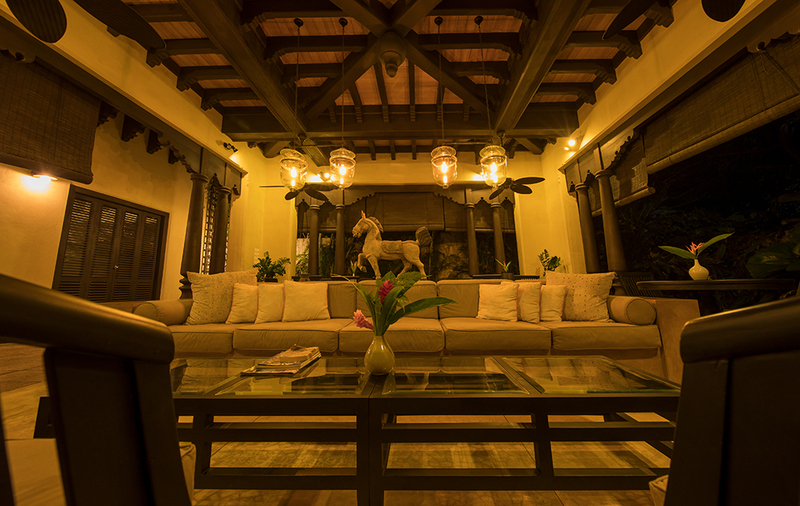 A Bose surround sound system is available for music enthusiasts. 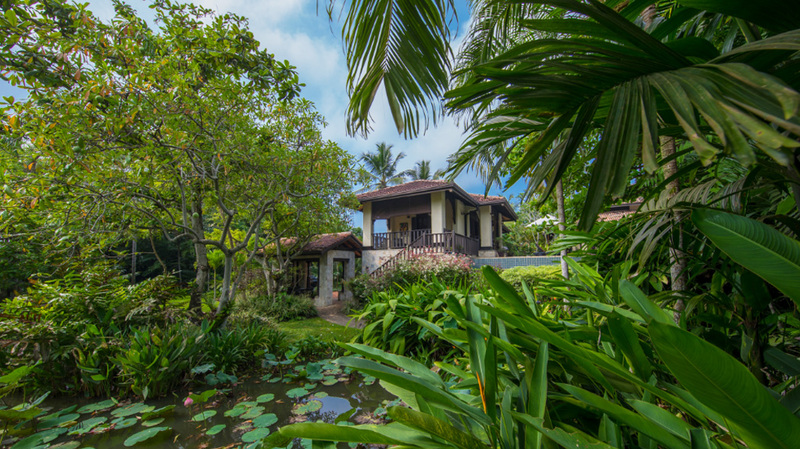 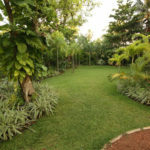 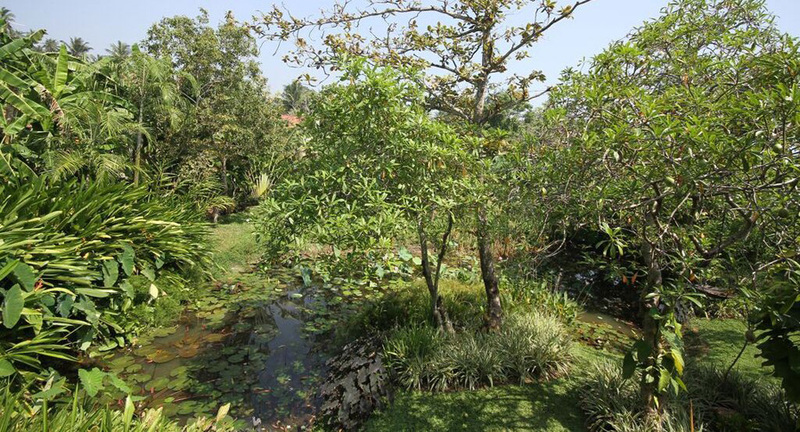 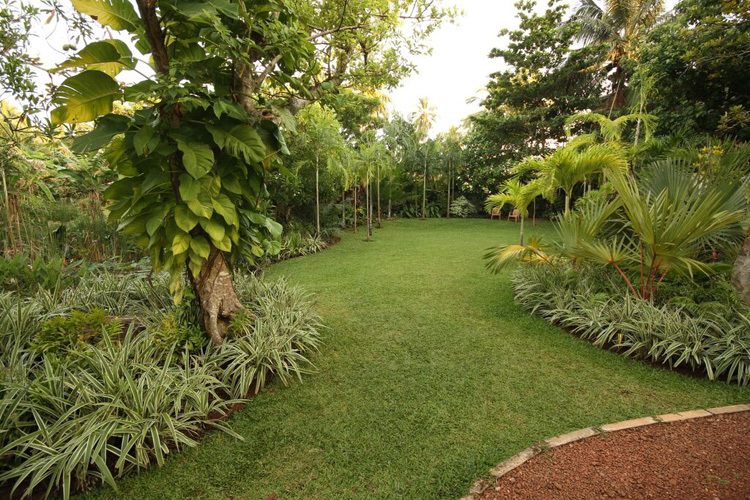 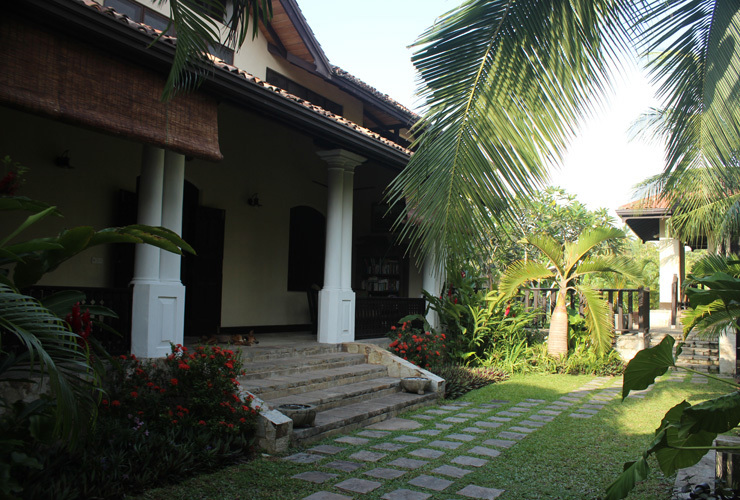 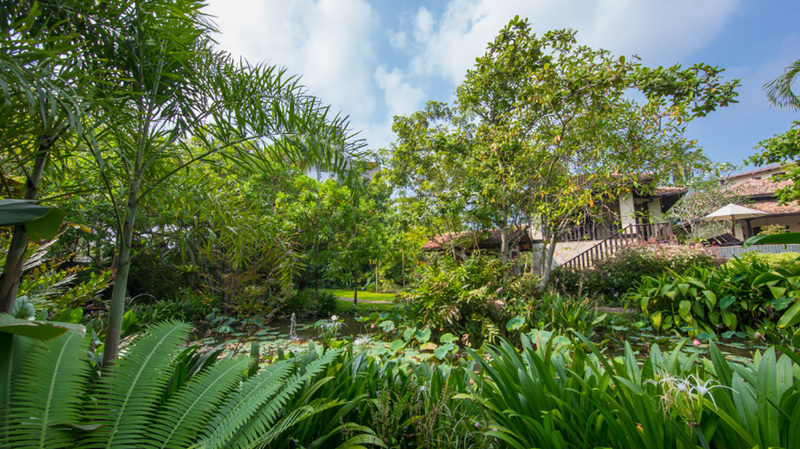 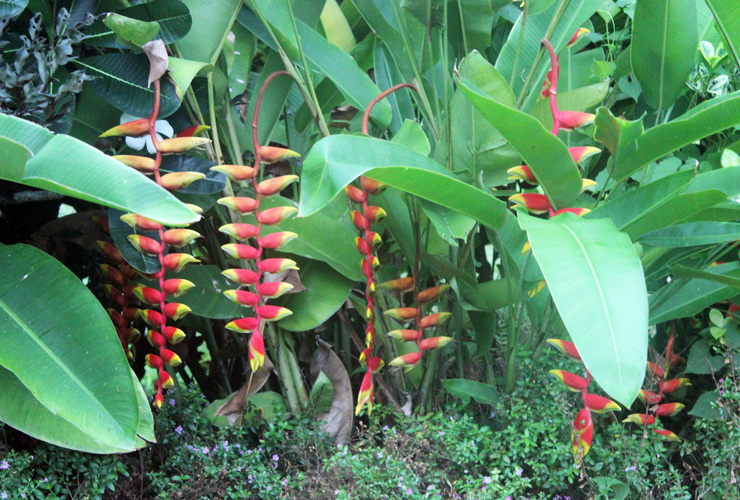 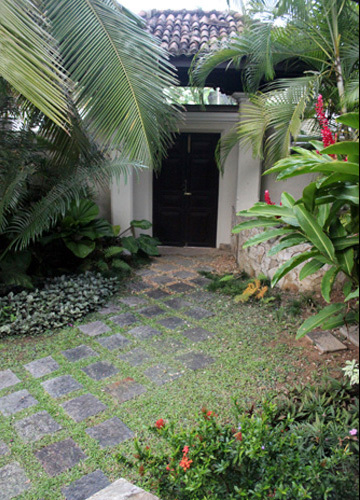 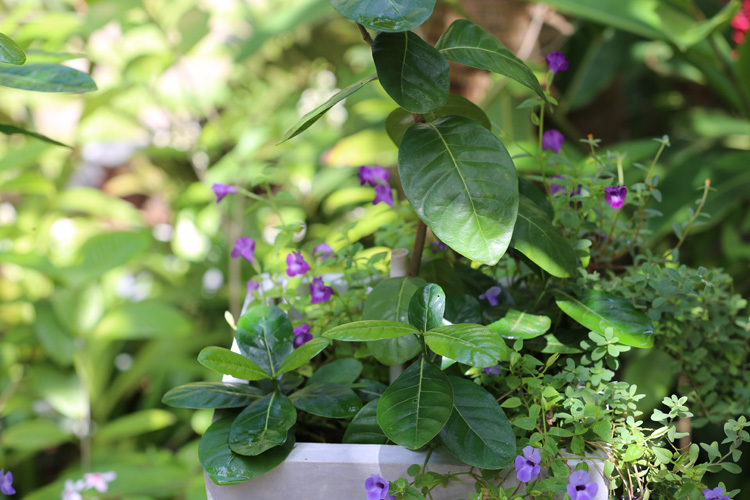 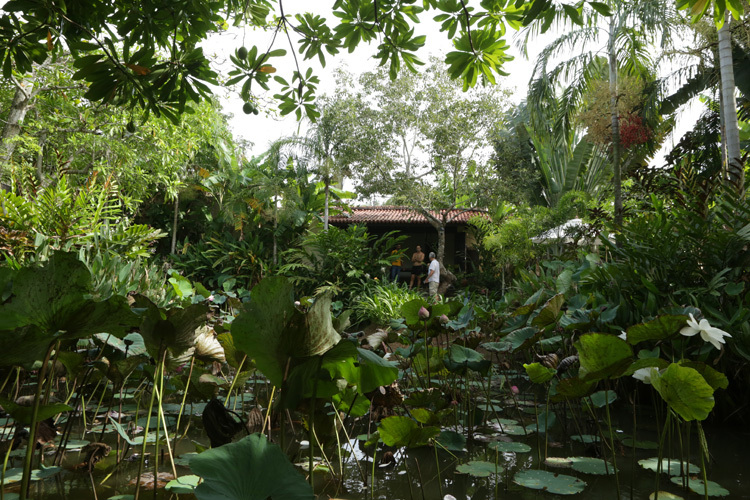 The verdant gardens of Sergeant House are an important component of the property. 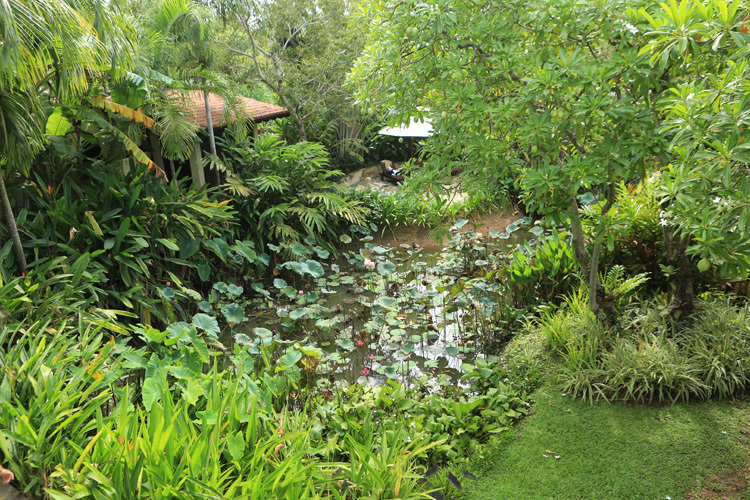 Our staff work hard to maintain the gardens which are a haven for local birds and wildlife. 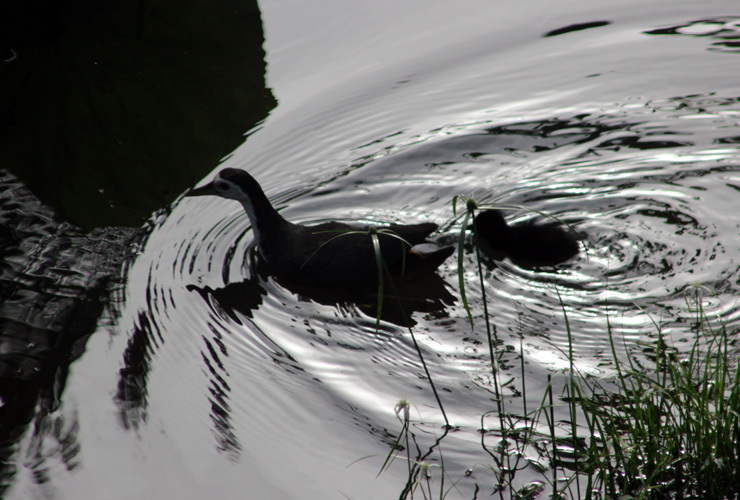 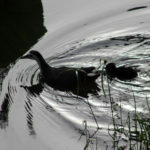 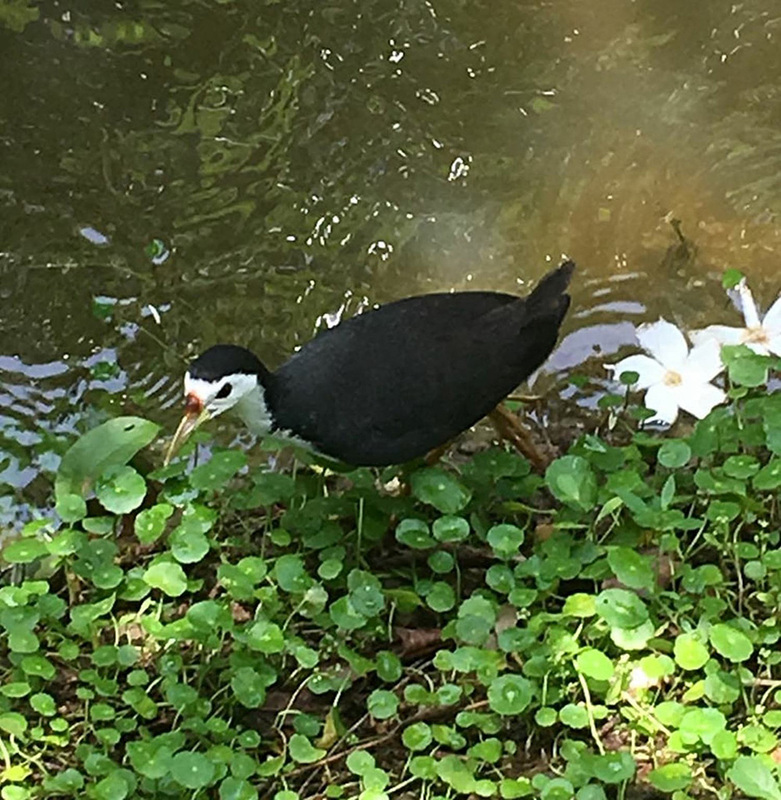 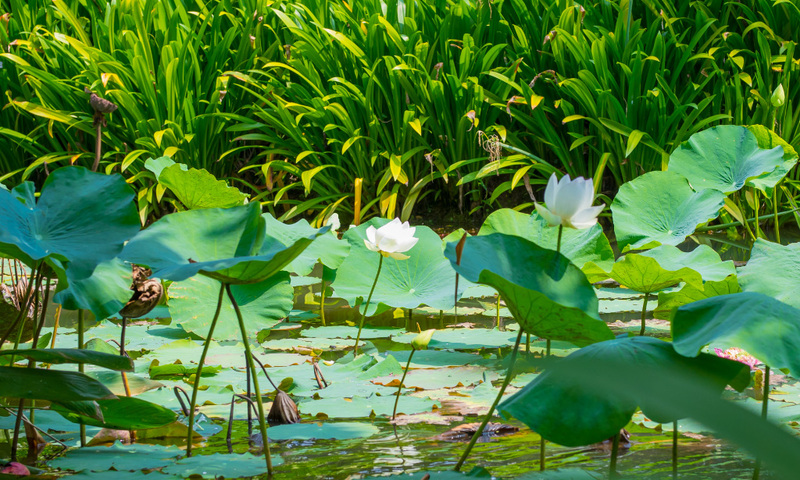 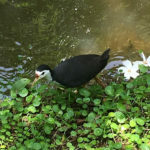 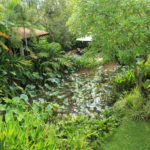 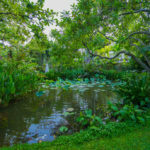 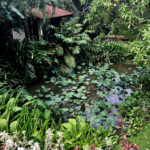 The water lily pond with its fish, green frogs and elusive turtles, attracts many birds including water hens, herons, cormorants and kingfishers whilst the garden is full of magpie robins, bul buls, pipits and other indigenous bird species. 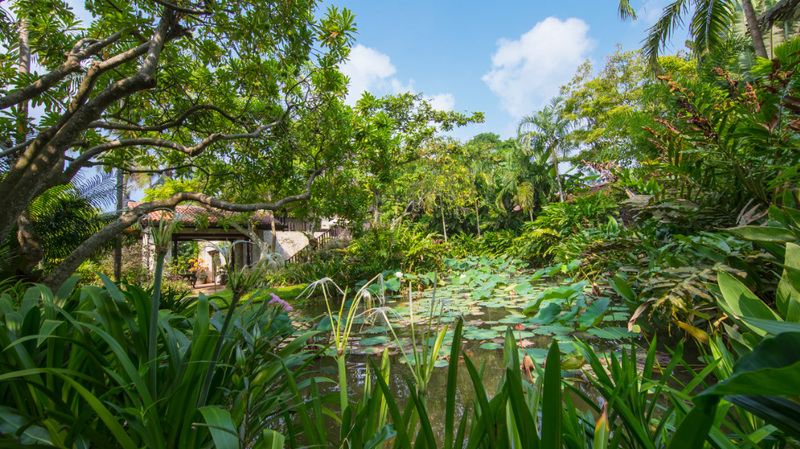 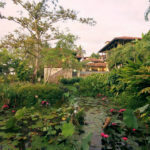 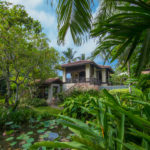 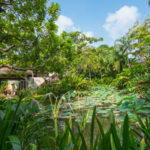 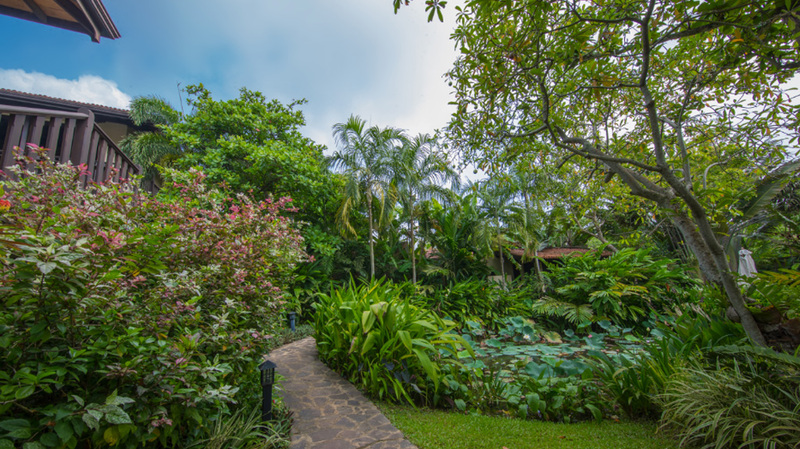 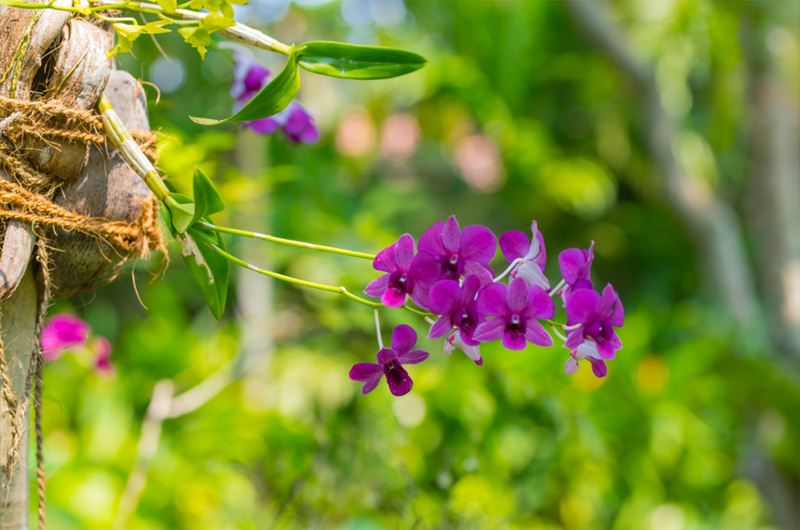 The tropical flowers and trees represented in the gardens create the closest thing you will find to a botanic garden in Southern Sri Lanka, displaying 30 varieties of palms and cycads. 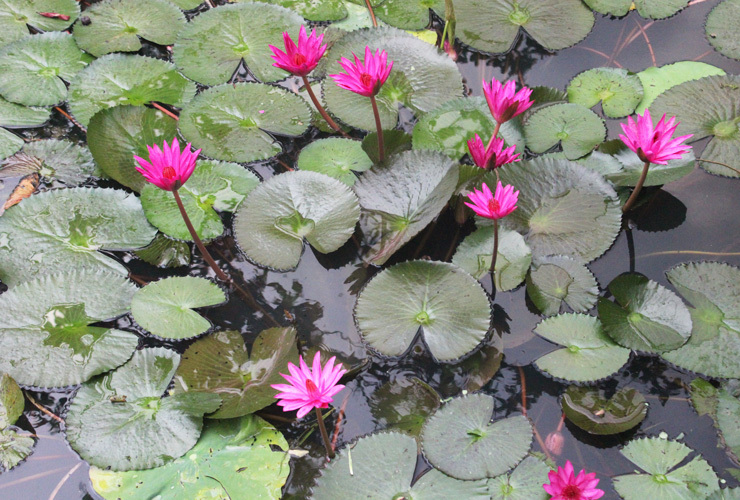 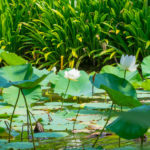 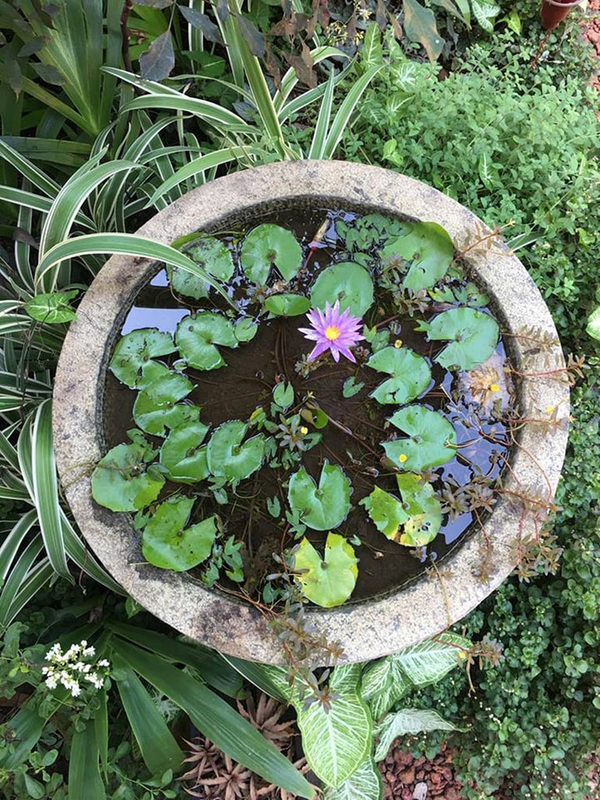 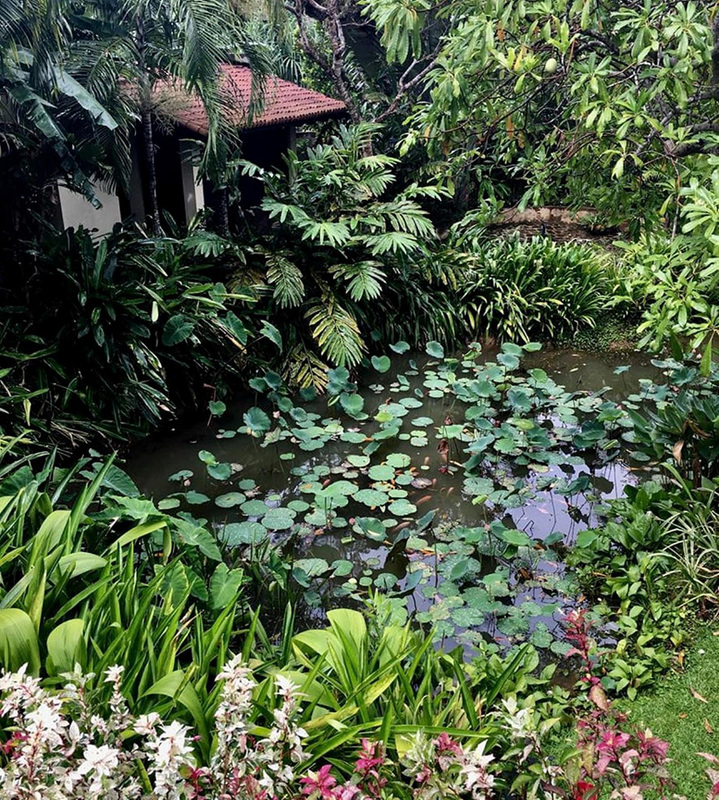 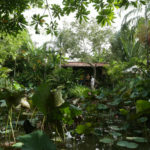 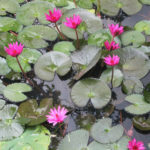 The water lily is the national flower of Sri Lanka and the striking cerise and white specimens are well represented in our garden pond together with the flounced leaves and huge pink, ruffled lotus flowers. 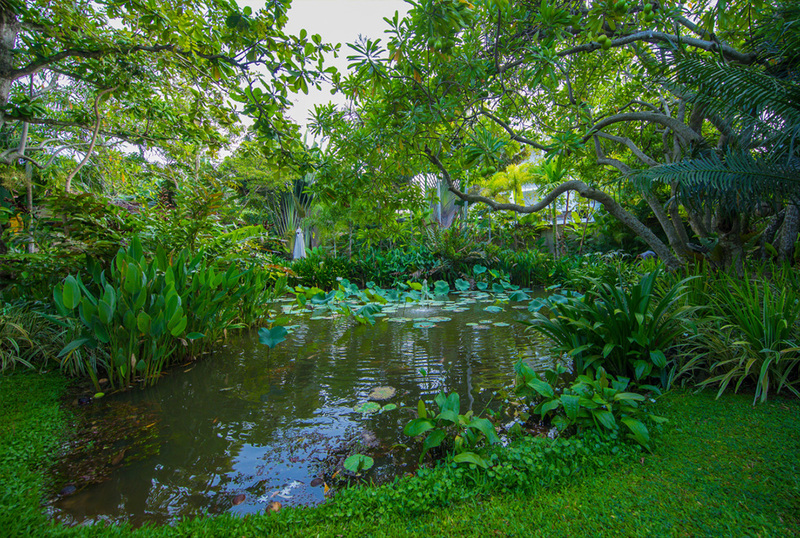 The lawn beside the pond is encircled by elegant, tall palms and is perfect for a game of badminton or a yoga and meditation session. 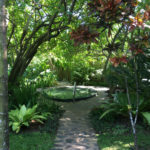 We are proud of our green oasis and hope you will take time to relax and enjoying it too.